If I told you you could now get an authentic python handbag for less than $2,000, would you be pleasantly surprised? Or would you (rightfully) slap me in the face? Well, friends, IT EXISTS, and Kate Hudson is carrying one this week. Can you guess which brand is offering such an unbelievable bargain? I bet you can. In other celeb handbag-carrying news, Altuzarra's debut handbag line is a hit with certain British celebs this week, and there's a fair amount of sticker shock (the good kind) waiting within. Here's Angie Harmon, leaving dinner at Craig's with a chic black and leopard print Christian Louboutin Passage Bag. This bag isn't brand new, but it may be new to you, and if you absolutely love it, then you should be advised that it's currently 40% off at THE OUTNET. Do with that information what you will. Cat Deeley was recently spotted doing a little shopping at Barneys New York in Beverly Hills. Incidentally, she's carrying a gorgeous little handbag that is exclusively available at Barneys: the Altuzarra Ghianda. (Altuzarra's first handbag line just launched mere months ago.) Kat is carrying the smaller saddle bag version of this style, there are also small and large hobo versions available, as well as a $28,000 croc Ghianda, if anyone's interested. Here's Christie Brinkley, arriving at her NYC hotel with a luxe, oversized Lanvin Tassel Tote. At under $2,000, this tote is probably one of your bigger dollar-per-square-inch bag bargains, at a premiere designer level. Lanvin bags seem to be pretty consistently underpriced and underrated. Were you aware that there are not one but two Veuve Clicquot Polo Classics? One takes place in New Jersey in the summer, and one takes place in Los Angeles in the fall. Here's January Jones, attending the LA Classic with a dainty, sculptural 3.1 Phillip Lim clutch. Kate Hudson was recently spotted heading to NYC via LAX for press rounds for her new flick, Rock the Kasbah. She's carrying a bright blue python Michael Kors tote, and yes, the Michael Kors website says it is made of genuine python. Allow me to reiterate: this genuine python bag somehow retails for less than $2K. Here's Kourtney Kardashian, taking her niece North West to ballet class in LA, like a true champion auntie. Kourtney is carrying one of her fave styles, a shell pink Balenciaga Mini City Bag. 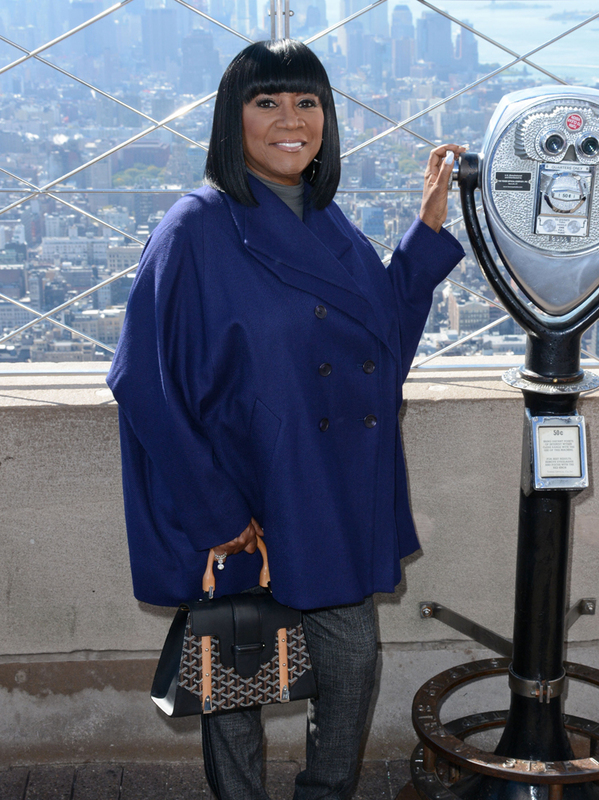 Patti LaBelle recently had the honor of "flipping the switch" at the Empire State Building for a special event commermorating Gabrielle's Angel Foundation for Cancer Research and their annual Angel Ball. As New Yorkers might have noticed, the building's lights were briefly purple and red last week. 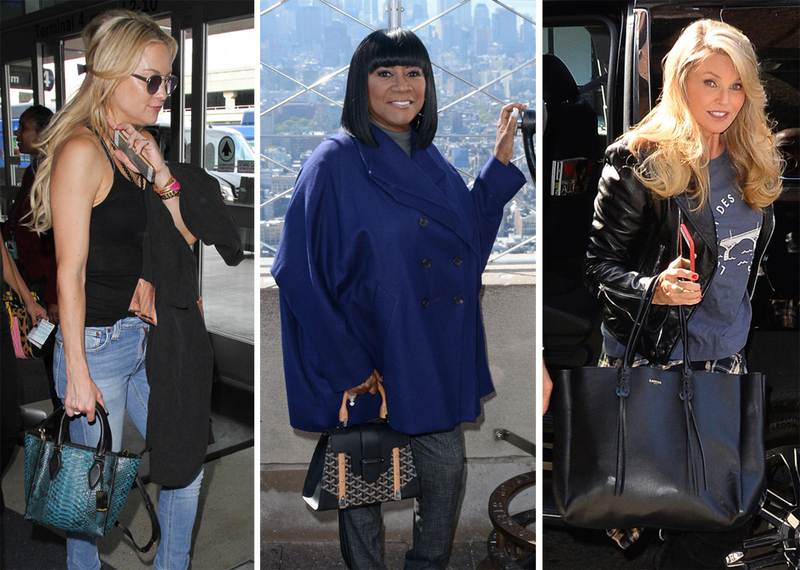 Patti is seen here carrying a Goyard Saigon Top Handle Bag. Her love for this bag is well-documented. Finally, here's designer Rachel Roy, also attending the Veuve Clicquot Polo Classic in LA. She's carrying a taupe Hermès Kelly that is expertly color matched with her taupe jumpsuit. The jumpsuit is one of Rachel Roy's signature styles, and there's a decent chance she designed this one herself.